Glastonbury Festival hosts a population of over 200,000 - making it the second largest city within Devon and Somerset, Plymouth being the largest. Such an enormous site represents a major challenge for all the emergency services who are engaged to ensure public safety throughout the duration of the event. Involvement for Devon & Somerset Fire & Rescue Service means detailed planning prior to the event. During the festival 24 hour resilience and support is delivered as part of a multi-agency approach with resources to cover the operational response, fire protection and enforcement, fire prevention and education and a strategic command team so that public safety is maintained. 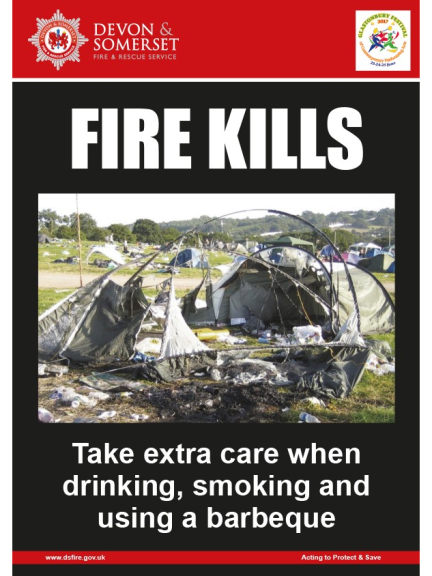 Safety messages are delivered throughout the festival and after discussions with Glastonbury festival organisers a particular focus this year is highlighting the danger of Carbon monoxide (CO) poisoning. Carbon monoxide (CO) is produced when a fuel such as charcoal, gas or petrol burns incompletely. This could be because an appliance isn’t working properly or might simply happen as part of its normal function. You cannot smell, taste or see Carbon Monoxide, so…if you suddenly get flu symptoms, or have headaches, nausea and vomiting, dizziness, drowsiness or weakness you may have Carbon Monoxide poisoning. Carbon Monoxide is potentially fatal and even low-levels of the poison can cause lasting damage to your health. The best advice is to avoid any chance of being poisoned in the first place. Did you know that BBQs give off poisonous carbon monoxide hours after use? BBQs are designed for cooking not for heating up spaces. Modern tents are designed as an integral structure with built-in groundsheets, if portable or disposable BBQs are bought inside to warm the tent up and carbon monoxide gases can rise to fatal levels in a matter of minutes. To work safely BBQs need more ventilation than your tent or awning can provide and there’s also the risk of fire. Don’t rely on a carbon monoxide detector to keep you safe in a tent or awning. They may be useful at home, in a caravan or in a motorhome, but they are not designed for the conditions found in a tent or awnings. We would like to offer some safety tips to make sure that you have a safe and enjoyable time. Never take a barbecue into a tent awning, caravan or motorhome. Even a cooling barbecue gives off plenty of poisonous carbon monoxide (CO), which can kill. Never use a fuel-burning appliance to heat your tent or awning. Gas and kerosene heaters – unless they are permanently fitted in a caravan or motorhome – should only be used outside. Stoves and barbecues are designed for cooking not space heating. Use a carbon monoxide (CO) alarm, in your caravan or motorhome though it should never be used as an alternative to the precautions above. For further safety advice please visit Glastonbury Festival website or visit our Glastonbury webpage.